Game on for Gameworks menu prices. GameWorks is a unique place to create and celebrate memorable experiences because it is an entertainment center where people can enjoy delicious food, friendly games, and fun sports for the entire family. The center’s goal is to provide a safe gaming experience with wholesome activities that everyone will enjoy, from adults, kids, and teenagers. There are seven locations across the United States that offer classic and trendy arcade games, American comfort food, and a wide range of cocktails, craft beers, and beverages. Below are the latest Gameworks menu prices. The concept of creating an entertainment center such as GameWorks is from the joint venture of Sega, DreamWorks SKG, and Universal Studios. While it has not been a smooth sailing business adventure for the establishment, through the help of an investment group in 2011, GameWorks was able to bounce back, even acquiring several assets of Jillian’s Billiards Clubs from the states of California, Virginia, and Washington, and branching out internationally to make them well-known worldwide. Regulars of Gameworks can sign up to be a part of the GamePerks rewards program. Members get rewarded for every time they visit a Gameworks location. Members also receive regular emails about special promotions, offers, and upcoming events. GameWorks provide classic American dishes, which include affordable sandwiches, pasta entrees, and family combos, all for the cost of not higher than $20.00. Family and friends can feel at home while chilling in the dining room or watching the latest football game drinking iced cold beers. The place also offers a Happy Hour from Monday to Friday to make sure guests have the time of their lives. 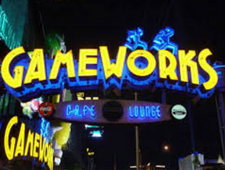 For more information about Gameworks, visit their official website. What time is Happy Hour at Gameworks? Happy Hour is between 3:00 pm – 7:00 pm, Monday – Friday.